I wrote an article on LinkedIn earlier and thought I’d share it here too. The basic premise is this: Last weekend I had extremely high expectations of a certain coffee shop in Cape Town, because of the phenomenal reviews I’d read about it online, and was subsequently disappointed. However, visiting other restaurants on the same weekend, which both had little to no expectation whatsoever, left me overwhelmed. The trick, though, is how much do you hype yourself or your business up, without potentially disappointing people? How much is just enough? You can read the article here, or read below the line. Would love to hear your thoughts. My wife and I spent last weekend in Cape Town CBD. We often travel to the CT area but mostly spend time in the northern suburbs or the winelands, so we decided to try something different by staying in the middle of town through Airbnb. As we’re big fans of good coffee, we did a little research beforehand. Of the multitudes of great Tripadvisor suggestions and other site reviews, the top result was Truth Coffee on Buitenkant. 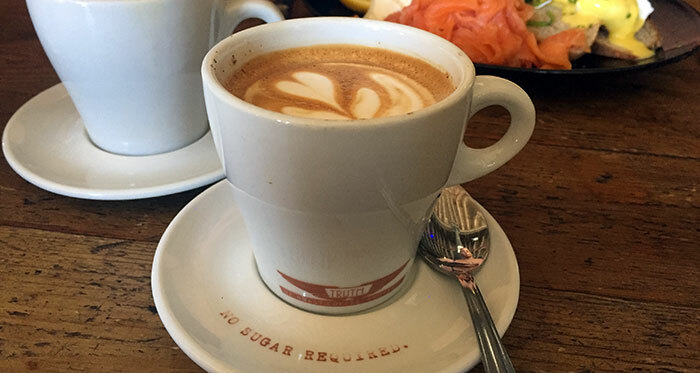 Also rated by The Telegraph as the world’s best coffee shop, how could we not visit!? So we saved this little gem for the Sunday morning, to finish the weekend on a high. I mean, we’d be having breakfast at the best coffee shop in the world, it had to be off the charts, right? Everything was… good. Not great, not spectacular, but just… good. The coffee was as expected. They frown upon adding sugar or sweetener – saying it’s not necessary – so it was more bitter than we prefer. Drinkable? Of course. Enjoyable? For sure. Phenomenal? No. Now, I’m not saying Truth needs to change their ways to suit me. On the contrary, I think sticking your guns is paramount to ensuring you keep the lovers coming back for more. However, after hyping up our potential Sunday morning extravaganza, we left feeling a little disappointed, like we didn’t get to experience the best coffee shop in the world. Truth is a quirky, steampunk-themed restaurant with good (I repeat, good) drinks and food. Just good. On the Saturday morning I sleepily scuttled over to a small coffee shop across the road from where we were staying for a first-thing kick-in-the-pants coffee, and were phenomenally impressed. So much so that I couldn’t wait for my next cup the following morning! Great service, fantastic cuppa Joe, and a free little meringue. Gold! Then, later that day we were chatting to a mate of ours and he suggested a little Indian place for dinner that night. “Nothing big and crazy. Just quaint but with a cool vibe and decent chow.” As he’s vegan, we didn’t expect a lot, but took his suggestion anyway. You need to give vegans small wins every now and again, right? After smashing through dinner, we were really glad we took the suggestion. Delicious, authentic cuisine with an awesome vibe to match. Way better than we’d expected. So the trick is this: We visited both the above with zero expectations, and loved them. We walked into Truth expecting to be blown away, and were disappointed. So, bringing it to a personal and business perspective, how do you continue to keep clients – and potential clients – keeping you top of mind because you’re ‘the best’, ‘the fastest’, ‘the sexiest’, etc. without setting yourself up to fail? How much hype and advertising is just enough? Seriously, it’s a question. Would love to hear your thoughts. In this crazily connected world, and in an attempt to get as many towns/cities/countries/continents connected for New Year as possible, please send me a pin/location of where you’re celebrating New Year’s tonight? Ours below. Here’s to a crazy awesome 2017! I also included a location pin to where we were. 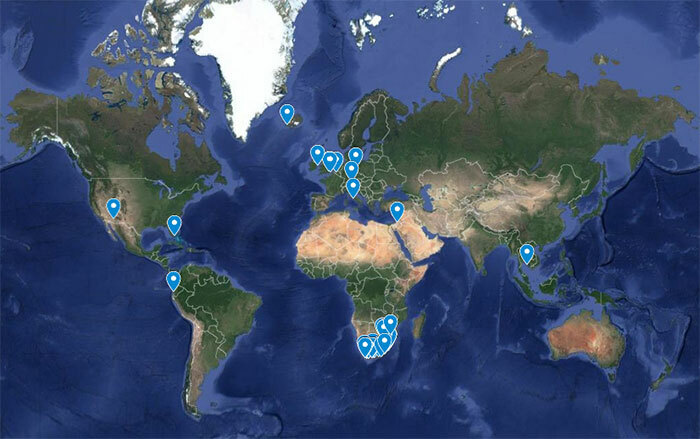 I was overwhelmed by the responses, and below is a big world view of where I received messages from. Pretty cool, I thought.